President Kwang-Gi Min of ECMiner (left) and UNIST President Mooyoung Jung (right) are posing for a portrait at the signing ceremony for cooperation MoU. Using data analytics to deliver more personalised services. With advanced big data analytics technologies, it is now possible to understand and predict human behavior, tailored to each individual’s needs and preferences. 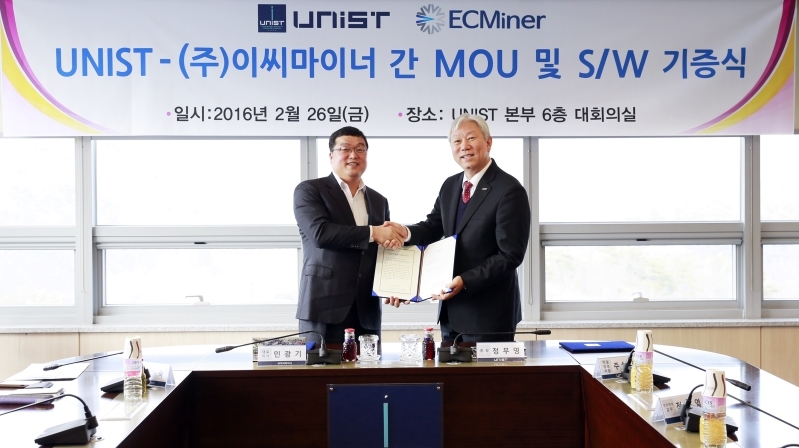 On February 26, UNIST signed a Memorandum of Understanding (MoU) with ECMiner Co. Ltd. to pledge mutual support for one another in the pursuit of excellence in the development of personalized big data applications. In conjunction with ECMiner Co. Ltd., UNIST’s big data research is expected to gain momentum for development, as both organizations are starting to see the potential of this “big data” technology for accelerating scientific discoveries and the promise of personalized big data applications. The ceremony was attended by President Kwang-Gi Min of EC-Miner, President Mooyoung Jung of UNIST, and other key officials from both organizations. Through this MoU, UNIST has secured the right to use ECMiner’s big data analytics software to support for the next five years of the big data-related research. In the memorandum of understanding, the two institutes agreed to deploy development framework for building personalized big data applications, such as the ‘Smart Cars’ with driver performance-based model for predicting future crash involvement, and also the ‘Smart Displays’ that can provide real-time diagnosis of eye fatigue of its users.